Celebrate Valentine's Day, aka, Single's Awareness Day, with the birds or a loved one. If you've ever wondered how birds choose their mates, you'll be pleasantly surprised at our Valentine's event. 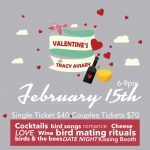 Be prepared for lots of hearts, games, wine and cheese, while learning about the birds and the bees (okay just birds). Mix and mingle with other singles, bring a date, or just make it a girls (or guys) night out. Tickets are $40 per person, $70 per couple.